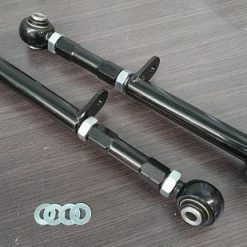 A pair of steel adjustable rear traction rods for Toyota JZX90, JZX100 & JZX110 models. These will allow you to fine tune your suspension setup and determine the amount of toe-in that is applied to the rear wheels under compression, altering traction levels. 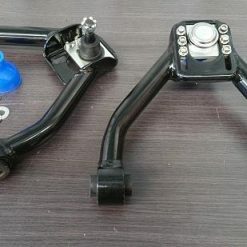 Using high quality, UK sourced XM-Series rose joints these arms eliminate the original soft rubber bushes to improve suspension response and provide more direct handling. Driftworks alignment arms are sold with a two year warranty against rod end and bearing failure and a lifetime warranty against structural arm failure. Do not confuse these with cheap, generic arms – they’re the same as used on championship winning drift and track cars around the world.